Do you want to donate dental equipment or supplies? If so, NASDAD might be able to help! If we are able to help coordinate your donation*, we will be able to send you a tax deductible receipt! We use the donated equipment, when possible, to assist overseas mission dental clinics that are connected to the program. It is only through the generosity of people like you that we are able to give them equipment. SERIAL NUMBER is required for all xrays or xray equipment. Donations will not be accepted without this information. A donation receipt cannot be issued without a serial number. XRAY HEADS NASDAD cannot accept a donation that consist only of xray heads. DISPOSAL FEE There is a $250 disposal fee for every donated XRAY HEAD, IF it is determined to be non-functional. This determination will be made by the driver when he picks up the donation and the fee is paid directly to the driver. The fee is not paid to NASDAD. It is your responsibility to handle all paperwork necessary for the registration of your xray machine. You may present your paperwork to be signed by the driver when he picks up your xray donation. 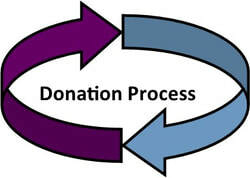 Donation receipt is based on the Letter of Intent. Be sure you complete the document EXACTLY how you want reflected on your receipt!!! Verify with Katie the receipt of your completed Letter of Intent, email at nasdad@llu.edu or telephone 909-558-8187. Coordinate a pick up or drop off of equipment – contact Katie for the name & number of an Equipment Pick Up Representative. Office furniture, reception furniture, telephones, fax machines, computers/monitors, copy machines, and operatory cabinetry are not currently being accepted. Equipment: Must be in good and working condition. Is your location eligible for a pickup: Equipment located in most of Southern California counties or within a reasonable distance from Loma Linda, California is eligible for a pickup. If outside of the above mentioned areas, you may ship your donation to us. Please contact the office for shipping instructions. No Stairs: If equipment is located on an upper or lower level, an elevator must be available. Equipment & supplies will not be carried up or down stairs. Pre-screening: Due to cost of shipping donated equipment overseas, items older than 1995 must pre-screen. You may email a single photo of your item in question, along with the letter of intent, to NASDAD@llu.edu. The Letter of Intents below are identical except one is fillable from your computer and the other must be printed and filled out by hand. All equipment being donated must be disconnected prior to pick up. Equipment will not be unhooked or disconnected by the driver or person picking up the donation!! If your donation is where stairs may be necessary for removal, with no available elevator, it is your responsibility have it relocated to the main floor prior to the arrival of the volunteer for pickup. The IRS information page about non-cash donations can be found here. The IRS may require a professional appraisal to accompany your tax information for any non-cash donation valuing $5000 or more. NASDAD is not a qualified appraiser. The IRS talks about what makes a qualified appraiser here. The appraisal is not a NASDAD requirement but an IRS requirement. ​Please contact the NASDAD office if your non-cash donation will be valued at $5000 or more. NASDAD appreciates you considering a donation of dental equipment. And while, on occasion, we may not accept everything you offer, we do appreciate your willingness to consider NASDAD.